Solution: You have a sample of gas in a container with a movable piston, such as the one in the drawing. Redraw the container to show what it might look like if the temperature of the gas decreases from 300 to 200 K while the pressure is kept constant (assume the gas does not liquefy). 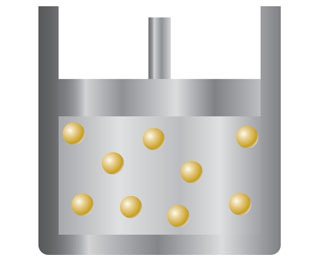 You have a sample of gas in a container with a movable piston, such as the one in the drawing. Redraw the container to show what it might look like if the temperature of the gas decreases from 300 to 200 K while the pressure is kept constant (assume the gas does not liquefy).